At last—a proven system for developing the strategic innovations every company needs to compete and win. As everyone knows, today’s unprecedented rate of business change demands new levels of strategic insight and adaptability. 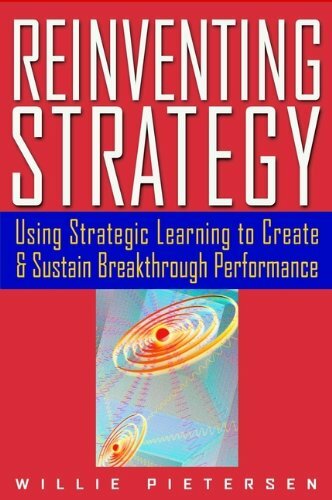 Reinventing Strategy is the first practical, systematic guide to creating an adaptive enterprise, showing how companies around the world are using the Strategic Learning approach to consistently out think, out maneuver, and out perform their competition. As Willie Pietersen explains, companies that aspire to long-term success must develop and implement strategy as part of a continuous four-step cycle-Learn, Focus, Align, Execute-and he offers dozens of provocative anecdotes and case studies, illustrating how to implement it at every level of an organization. Written with unusual clarity, frankness, and wit, Reinventing Strategy will change the way managers everywhere approach their greatest and most important challenge: the need to make strategy into a tool for ongoing corporate renewal. When I was a globe-trotting CEO, I wrestled with a common dilemma - how to spend more time with my kids, Chris and Sally. I developed a weekly ritual with Sally, then eight years old. Every Saturday morning, we'd sit down to play a game of checkers. It was our quality time together. Sally was a rather good player for such a small child, and she wouldn't tolerate my attempts to help her with an extra checker or two; she wanted to win on her own skill. But she never quite managed to beat me. Then early one Saturday morning she dragged me out of bed to play a new game. I was jet-lagged after a long trip, but happy to play with her. Sally's new game was a Nintendo video soccer game, and within minutes she had vanquished me. Her peals of triumphant laughter filled the house. Chagrined, I tried my hand at the new game again, and then again, but she beat me every time. In fact, I was never able to beat Sally at video soccer. I share this story because it neatly encapsulates a powerful lesson for all of us, one that's as true for organizations as it is for individuals. No matter our age or background, we are all born in one era and must learn to adapt to another. We often hear that the central challenge facing business leaders today is "the need for change." In fact, this idea has been repeated so often that it has become accepted as a truism. But it's only half true. And a half-truth, like a little learning, is a dangerous thing. The problem with this idea is that it strongly implies that change is a one-time event; that a company only needs to go from point A to point B in order to succeed. This A-to-B approach is at the core of traditional strategy, but in today's economy it is potentially lethal for corporations. One-time, A-to-B change will only get you stuck in a new rut, and in the meantime the market will roar ahead and leave you behind. As the American humorist Will Rogers used to say, "Even if you're on the right track, you'll get run over if you just sit there." Instead, change must never stop. In today's global, fast-changing economy, companies must keep making the leap - to adapt from checkers to video games to Web-based adventure games and to whatever games will succeed these - over and over again. Because the environment in which we operate is continuously changing, we must respond by continuously innovating and adapting to it. Thus, the central challenge facing managers today is to create and lead an adaptive enterprise - an organization with the built-in ability to sense and rapidly adjust to change on a continuous basis. Indeed, one of the biggest headaches facing executives is the struggle to repeatedly mobilize their companies behind new ideas. This is a much harder task than one-time change. Sustainable competitive advantage cannot come from any particular product or service, no matter how good it may be. Those things have a short shelf life. In today's marketplace it is the organizational capability to adapt that is the only sustainable competitive advantage. By 1987, 61 of the companies listed in the original Forbes 100 in 1917 had ceased to exist. Of the remaining 39, only 18 had managed to stay in the top 100. In the 1920s and 1930s, the turnover rate of the S&P 90 (the original Standard & Poor's list of major U.S. companies) averaged about 1.5 percent per year. Thus, a new member of the S&P 90 list could expect to remain on the list, on average, for over 65 years. In 1998, the turnover rate in the S&P 500 was close to 10 percent, implying an average lifetime on that list of only 10 years. Of the five hundred companies originally making up the S&P 500 in 1957, only 74 remained on the list through 1997. While a few fast-moving entrepreneurs like Jeff Bezos at Amazon.com, Scott McNealy of Sun Microsystems, and Steve Case at AOL Time Warner have been quick to exploit the environmental shifts that have been fatal to others, many large, established companies find themselves bewildered by the speed and complexity of today's marketplace. This book is written for all kinds of businesspeople, but it is particularly aimed at managers in large, established companies who are trying to compete in the new economy. For these managers, I want to offer this thought: In today's turbulent environment there is no more powerful tool for the development of winning business strategies than superior insight. And to achieve such insight and use it to create and implement breakthrough strategies again and again, a company must have a practical and proven process. Consider this analogy. Over a century ago, industry was being revolutionized by the advent of systematic research and development (R&D). Beginning with Thomas Edison, who founded the first industrial research lab in Menlo Park, New Jersey, in 1876, and continuing with such German firms as I. G. Farben, the development of new technologies was taken out of the realm of serendipity and made into a deliberate focus of time, effort, and resources. "As a result, technical advances no longer happened randomly but could be systemically planned," economist Lester Thurow has noted. "In the twentieth century, economic leadership would become a matter of systematic investment in R&D to deliberately invent new technologies." In the same way, strategic innovation is too important to be left to chance, or to random, ad hoc initiatives. Just as companies invest in R&D processes to deliberately spur technical innovation, we need a systematic process to mobilize strategic innovation. Henry R. Luce, the entrepreneurial founder of the great Time Inc. media empire, once remarked, "Business more than any other occupation is a continual dealing with the future." Strategy - either implicit or explicit - is the means by which companies create that future. Unfortunately, the traditional ways of developing strategy no longer work. Based on a static planning model, they are hopelessly out-of-date in a world characterized more by shifts and discontinuities than by predictable patterns. We need to reinvent strategy as a process to generate continuous renewal in times of constant change. This book offers a set of operating principles and a leadership process aimed at accomplishing this, which I call Strategic Learning. It is designed to provide a practical way to transform staid, established organizations into fleet, adaptive ones. Strategic Learning has four key steps - learn, focus, align, and execute- which form a self-reinforcing cycle that combines learning, strategy, and leadership into one organic process. This cycle is designed to produce specific outputs: to generate insights, create focus, and translate focus into action, and then to repeat the cycle of transformation again and again. In its entirety, it offers a new way of leading companies. In writing this book, I have set out to combine my experience as a CEO of multibillion-dollar businesses with the academic theory I've studied and taught at the Graduate School of Business of Columbia University and what I've learned in observing and working with businesses from a wide range of industries. 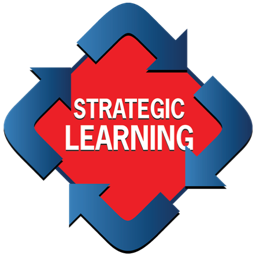 The concept of Strategic Learning has deep intellectual roots that originate in work done by scholars in learning theory, strategy, systems thinking, and organizational behavior. I have attempted to integrate and build on the best of this thinking. I believe that two features distinguish Strategic Learning from other approaches. First, it aims to pull all the elements of strategy creation and implementation together into a unified leadership process. Second, its purpose is to go beyond the rhetoric and provide a set of tools for creating breakthrough strategies on an ongoing basis. Above all, this is a practical book. There is a real hunger among businesspeople for tools that will help them transform their organizations. Unfortunately, much of the business literature offers advice on what companies should do without explaining how to go about doing it. I recently bought a management book in an airport shop, hoping to glean a few keen insights while en route to my next meeting. The book had an attractive cover and was filled with provocative thoughts, but after reading it I was left feeling empty. The advice it gave - couched in clichés such as "think out of the box" and "move out of your comfort zone" - was too vague to be of any use in the real world. What, I wondered, is a manager supposed to do with these ideas when arriving at the office on Monday morning - run down the hall shouting, "You've got to think out of the box!"? I don't see how that can help anyone. The point is not that the advice in the book was wrong. In one sense, it was completely correct. No one could argue with "thinking out of the box" and "moving out of your comfort zone" as necessary actions for companies seeking breakthrough strategies. The problem is that we've heard this advice a hundred times and have little to show for it. What's missing is the How: How are we to learn to think out of the box, act creatively, transform our companies, and so on? This is the void that Strategic Learning seeks to fill. In 1997, Arie de Geus, a one-time Shell Oil strategy guru and author of The Living Company, gave us the germ of a great idea: In the future, "the ability to learn faster than competitors may be the only sustainable competitive advantage." This was an arresting thought, but perhaps it didn't go far enough. Learning for learning's sake - which is where this idea might lead us - will not provide a sustainable edge. The real challenge is to learn strategically, to build an organization that continuously learns new things and translates them into breakthrough strategies. Strategic Learning has been offered in numerous executive programs by Columbia Business School and in many workshops I've conducted with executive teams. It has been taught and applied at companies like Ericsson, SAP, Sony Corporation, Deloitte Touche Tohmatsu, Chubb Insurance, Henry Schein, Inc., CGNU, ASEA Brown Boveri (ABB), Sun Microsystems, and Progress Energy. The Sony Corporation credits Strategic Leaning with turning around a loss-making division, its Sony Media Solutions Company. And many other organizations - from the Institute for the Future, a research-based think tank in Menlo Park, California (where I am chairman) to a nonprofit youth orchestra, an urban housing program, and a Florida drug-rehabilitation project - have applied it to their own specific needs. The process has also shown itself to be a valuable framework for personal growth and leadership development, as I discuss at some length in Chapter 11, "Strategic Learning as a Path to Personal Growth." Thus, Strategic Learning is proving to be a powerful tool not only for creating winning business strategies but also for developing personal leadership effectiveness. I don't claim for a moment that it is a silver bullet or an instant strategy-in-a-box. As we all know, those things don't exist. Strategic Learning is not a mechanical ritual but a leadership process based on a set of fundamental principles. In the end, it is the quality of leadership that determines its effectiveness. One day early in my teaching career at Columbia, I stood in front of a large class of high-powered senior executives. A few minutes into my lecture, as I was explaining the need for knowledge sharing in companies, a stubby finger at the end of a hairy arm shot out at me in challenge. "But that's not new!" a voice boomed across the classroom. Fifty pairs of eyes swiveled down at me in the teacher's pit, as if to ask: "What do you say to that, Mr. Professor?" I spluttered out a vague answer, and was able to keep the class moving along, but the stubby finger and booming voice lingered with me. To this day, I am grateful for that executive's challenge, because it forced me to clarify my own thinking. Now, when someone in a class says, "That's not new," my answer is: "Our issue here is not what's new. It's what's important." The biggest decisions we make in business, and in life, are identifying what's important. We tend to assume that old thinking is somehow bad and new thinking is axiomatically good. But this assumption is false. It's a cop-out from critical thought, and it can be a dangerous trap. While some new thinking provides real breakthroughs, much of it represents old ideas dressed up as new, or is simply faddish. Many of the lessons that have withstood the test of time, however, are eternal truths that can be applied to many different situations. This book aims to critically examine both the old and the new in the light of today's challenges and to offer a view on what's important. My own sense of what's important has been shaped by 20 years as a CEO and my current work as a professor, researcher, and corporate coach. This wonderfully rich combination of learning experiences has enabled me to pursue the quest that we all share - trying to discover what works, what doesn't, and why. From this fertile mix of practice and theory has grown the Strategic Learning process, and the book you hold in your hands. Reinventing Strategy is full of case studies and examples taken from the real world. Some are based on my own experiences as a CEO or on situations faced by companies I work with. Where necessary, I've disguised or fictionalized details out of respect for my clients' confidentiality. The stories, however, are essentially true, and the lessons they teach are absolutely valid. I hope they'll help you understand the power of Strategic Learning for generating insights and breakthrough strategies as a source of ongoing renewal - both for your organization and for yourself. "Finding ways to transform companies into adaptive organizations able to respond intelligently to an ever-changing environment has become the top priority for business leaders. Reinventing Strategy offers a proven process for doing just that. It is a wonderful mix of theory and practice, plus commonsense reasoning that works - for all the right reasons." "With today's uncertainties, a sound strategy is not enough for business success. Effective, dynamic leadership is more important than ever in piloting an organization through a constantly shifting environment. In this timely book, Willie Pietersen reveals the profound connections between strategy and leadership, and offers a proven method for strengthening both." "Relatively few people have the knack for creating business strategies that are truly new and effective. What makes these people special can't be bottled-but in Reinventing Strategy, Willie Pietersen comes close. His Strategic Learning method does more to systemize the process of smart strategy creation than any other approach I've seen." "Take the business savvy of a former CEO, mix in the leading-edge insights of a faculty member at a top business school, garnish generously with crystal-clear writing, and what do you have? Willie Pietersen's Reinventing Strategy—a must for executives in these turbulent times."